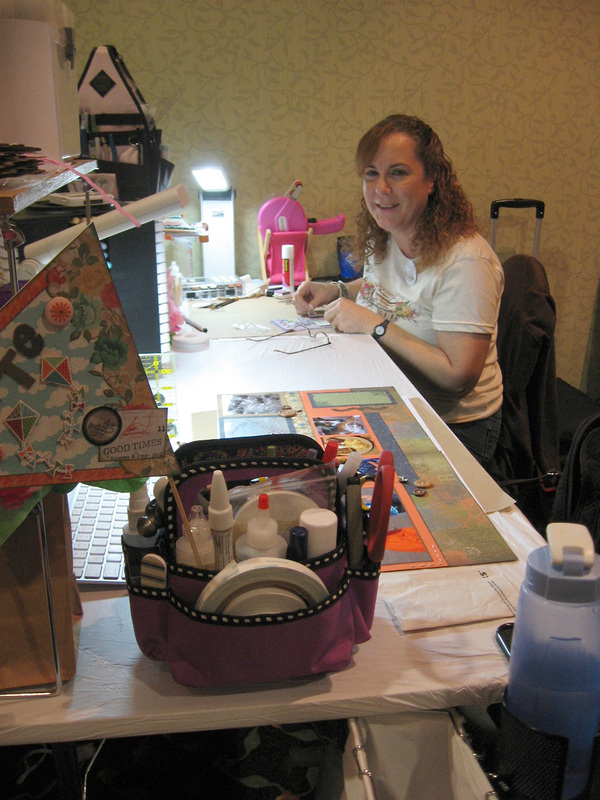 This past weekend I was a happy scrappy girl, because I spent it cropping at the Scrappy Boutique's 5th Anniversary Celebration Crop in Orlando at the Florida Mall Hotel with my friend Sherry. What a well-organized crop this was. I was impressed. The venue was perfect at the Florida Mall Hotel and the Scrappy B team was not only delightful but obviously worked hard to make it a festive, colorful, and fun event for us croppers. From the goody-bags filled with wonderful surprises, to the treat bags filled with sweet snacks (including a Tootsie-Pop with a paper mustache attached to the stick), to the lovely lunch on Saturday and breakfast on Sunday, the mini store on location, to the give-aways (a signed Tim Holtz Vagabond machine was the biggie), it was fantastic! 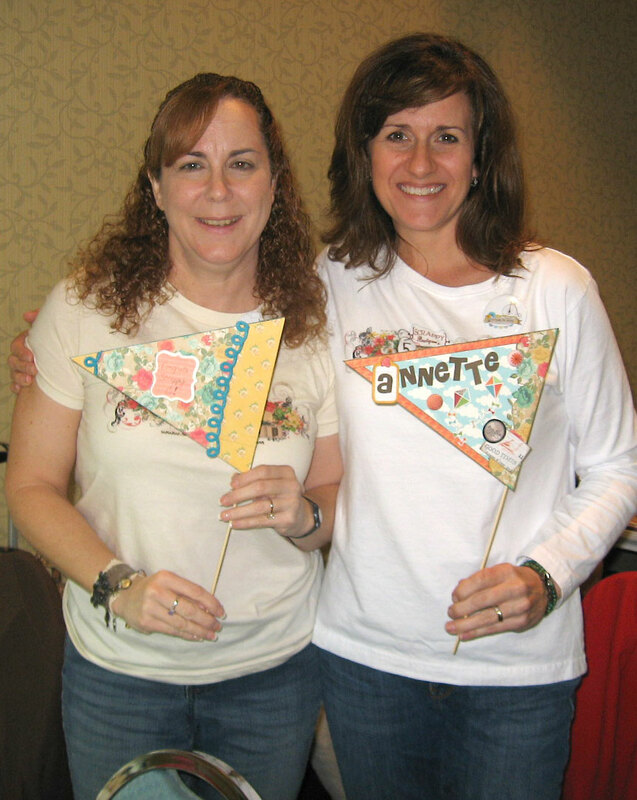 When we first arrived, we were given blank pennants on a stick and if you decorated your pennant with some of the supplies in your goody-bag, you received a free gift. So, of course, we got to work on those right away. 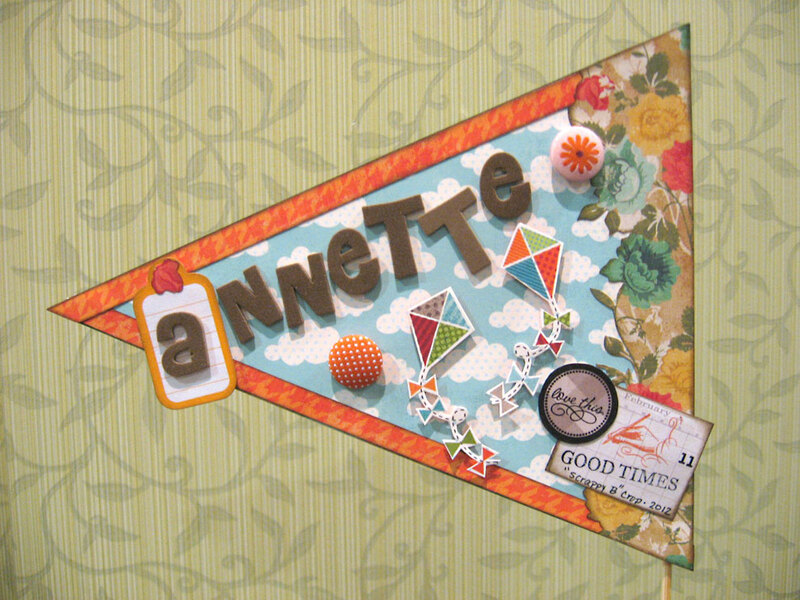 I had fun creating this pennant using papers from My Mind's Eye (Lime Twist), foam letter stickers (Thickers) by American Crafts, and big fabric brads by Pebbles. I added a bit of stamping (Close To My Heart) and now I have something fun to display in my studio! 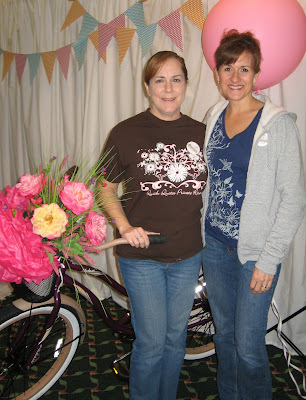 The Scrappy B team decorated the room with a happy-feeling floral decor, and had a photo-op area complete with backdrop, balloons, pennant banner and a charming bicycle with its basket filled with flowers. 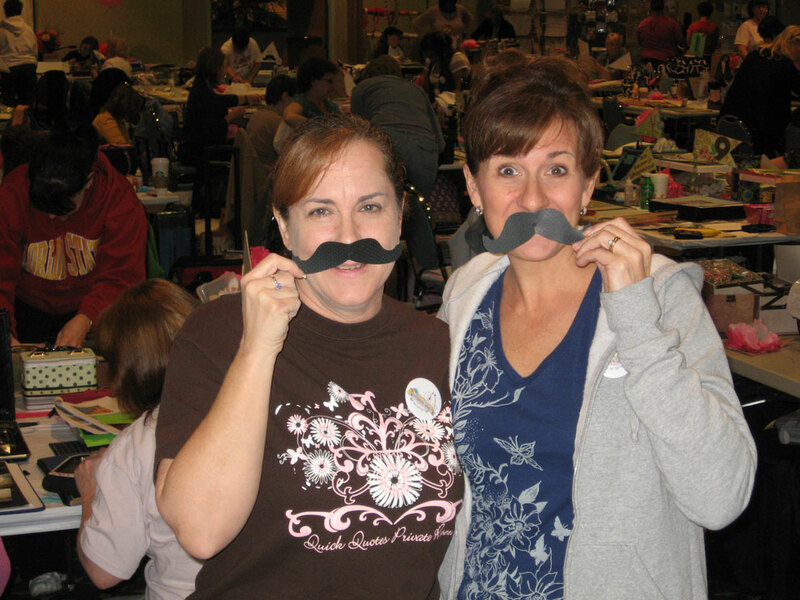 To the side, they even had cute props like mustaches on a stick, spectacles, little hats, flowers and more to choose from. Some of the croppers were very creative when staging their group photos. And if a cropper was in need of assistance, those Scrappy B girls were more than accommodating. I was in search of a 3/8-inch circle punch to borrow and Stacy herself (the Scrappy Boutique owner) walked around asking croppers for assistance for me. The Florida Mall is a place we frequent often (always tying in a stop at the Scrappy Boutique, of course) but I really had no idea about the hotel connected to the mall. I had seen it, but really paid no attention. Now that I've stayed there, I have to say it was outstanding. 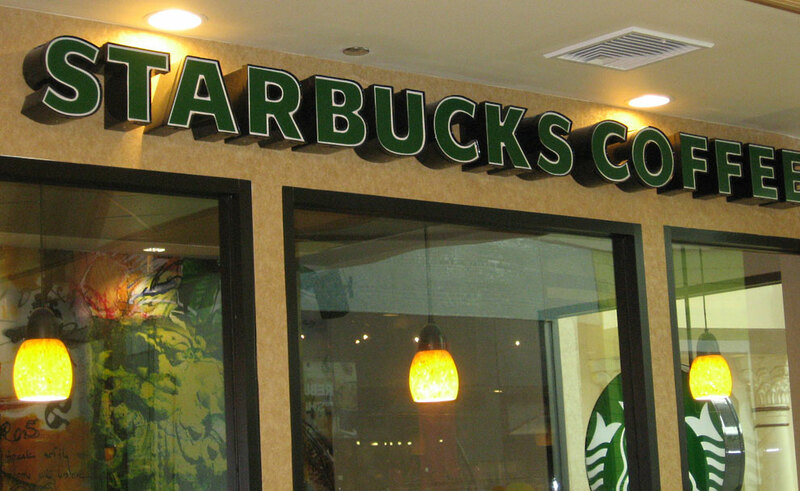 A beautiful hotel with everything we needed, excellent service and their own Starbucks, it was the perfect venue. Sherry and I had a wonderful time (thank you Sherry for sharing this time with me) and I managed to get completely caught up on my scrapbooking! Sounds like a fab weekend was had by all ! Wow, Annette, thanks for putting this blog entry together. I can't wait to show Rich. It was a really great time, and I also thank you for sharing your time with me. I got so much done!